McElhinneys is an award-winning department store and is one of the premier independent retailers in Ireland. Operating from an impressive 90,000 square ft. outlet in Ballybofey, Co. Donegal, McElhinneys stocks everything from high-end fashion and affordable luxury goods. McElhinneys is justifiably proud of it fabulous menswear, kids, sports, home, jewellery, beauty and lingerie departments, catering for every style and budget. We are especially renowned for our collection of bridal ware, bridesmaids and mother-of-bride outfits. How it Works: Use this gift voucher on AllGifts.ie to order gift cards for use in the McElhinneys department store in Ballybofey. Or you can swap this voucher for any other gift or voucher listed on AllGifts.ie. McElhinney gift cards are posted out free of charge once ordered. We are located in the heart of Ballybofey, with ample parking adjacent to the store. The Home and Living Department offers an unrivalled selection for your Kitchen, Bedroom, Bathroom and Livingroom, from everyday essentials to indulgent luxuries. Since its foundation in 1971, the recently renovated department store houses 22 departments in a 90,000 sq ft building. For inspirational, functional, stylish and affordable pieces for your home, the Home and Living Department offers an unprecedented collection. Boasting six sections within, from stylish Curtains to luxurious Bedding; from the trendiest Bathroom accessories to functional and affordable Kitchen Accessories; from Haberdashery to elegant and timeless Giftware, there are a host of designs and styles suitable for creating the perfect look for your home. 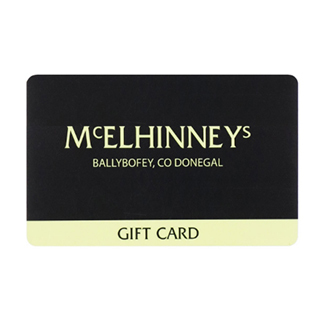 McElhinney's Gift Cards are posted out free of charge, normally within 5 working days.